Last week I entered myself in Foodbuzz.com's Project Food Blog at a chance to win $10,000 and a year long feature on their website. About 650 entries were submitted and... I'm advancing to the next round!! Thank you so much to all those that voted! I'm gonna need your help again starting tomorrow with this week's challenge. This week's challenge is tackling a classic dish from another culture. Something that is unfamiliar and out of your comfort zone. Because the French and Italian cuisine's are taken out of the options I was left with little.. but I guess that's where "going out of your comfort zone" comes in. I thought about cooking food and not dessert. But let's face it, touching raw meat and sauteing of any kind is something that still freaks the bejesus out of me so that was just out of the question. For now, anyway. Thinking about this challenge, for some reason I kept thinking about Baklava. 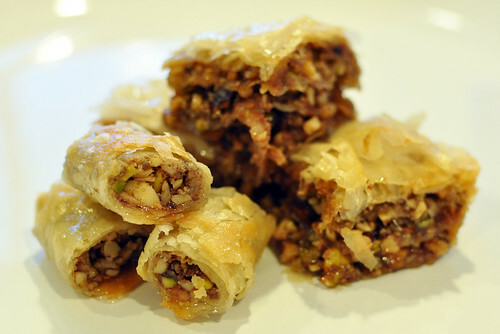 Baklava is a Middle Eastern dessert made of nuts, phyllo dough, and a sweet syrup. 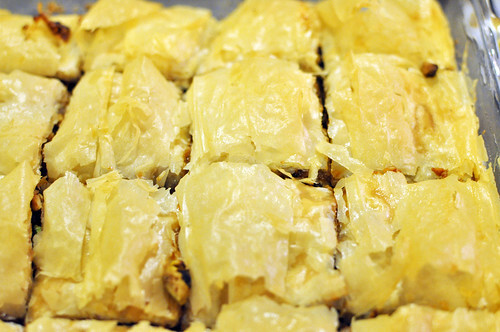 Phyllo is Greek for "leaf" which the flaky layers of the crust resembles. In doing some research it appears to have its origin in the Ottoman Empire (this information I got from Wikipedia, which we all know can be inaccurate sometimes so take it as you will). 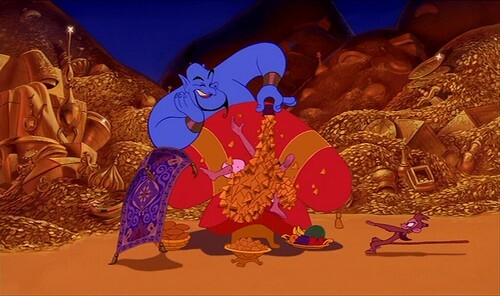 A brief mention about baklava in both movies but for whatever reason the images from the movies appear in my brain whenever I hear "baklava". 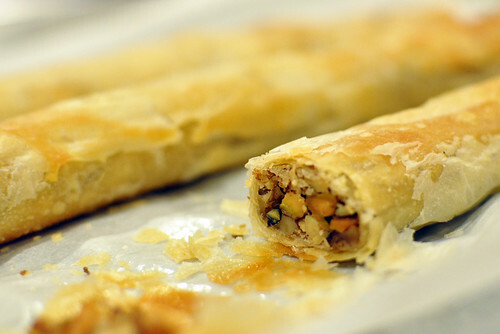 What I did know about baklava is that it uses phyllo dough. You can buy a box of phyllo dough at the super market and this is a snap. 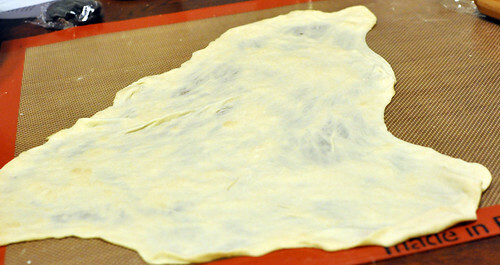 But, to challenge myself I decided to make my own phyllo dough. I remember making it once in culinary school and let me tell ya, all I could remember was that it required about 5 people to make it. 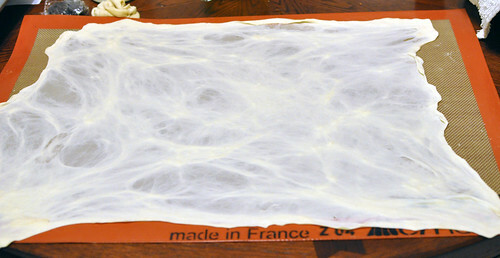 After some research online I found a phyllo dough recipe. Seemed simple enough. Flour, salt, warm water, and oil. In a bowl I added the 2 2/3 cups of all purpose flour and 1 teaspoon of salt. I mixed that together then made a well in the center and added the 1/2 cup of warm water. I could already tell that it wasn't enough water. 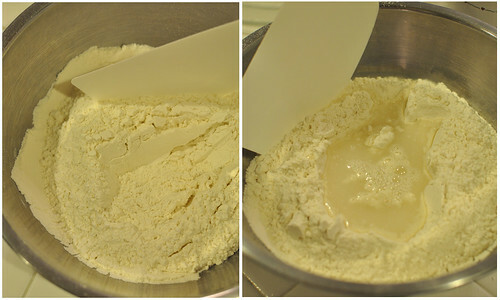 There were still a lot of dry flour left so I ended up adding about another 1/2 cup of water and kept kneading it in the bowl until it became a stiff dough. 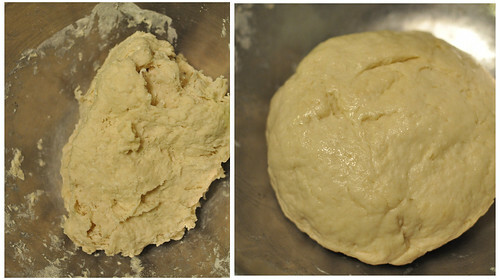 Then I kneaded in the 2 tablespoons of oil then formed it into a ball. The I left it covered in a warm area for about 2 hours. The gluten in the flour makes the dough elastic and rubbery and resting it allows the dough to relax and become easier to handle. After resting, the dough was really soft to the touch. 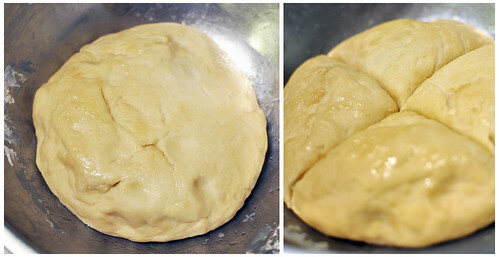 Then I divided the dough into fourths. 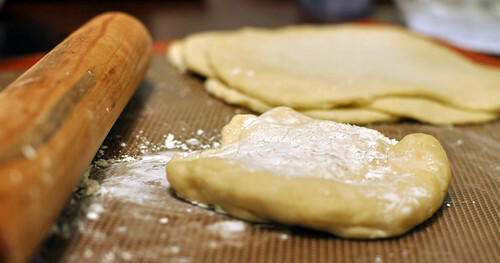 I took out a piece of dough at a time and rolled it out with a little cornstarch as flat as I could get it. Then that had to rest another 10 minutes or so, covered. Now, here came the tricky part. Stretching out the dough. These huge blotches all throughout the dough. I think it was when I was initially adding the water in the beginning. It was too dry. If I had added all the water in at once and kneaded it I don't think this would have happened. Oh well, c'est la vie. The second one turned out much better. Still a little blotchy yes, but it got much thinner like "tissue paper" like the recipe described. So from there I followed Alton Brown's recipe for baklava. Now, I know what you must be thinking, "Alton Brown?? He's not Turkish and DEFINITELY not Greek. How authentic is this so-called 'baklava'????" 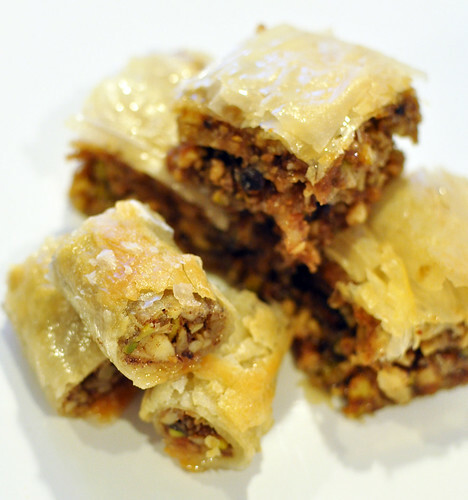 Surprisingly, a lot of the recipes I looked up for traditional baklava had very similar ingredients. The only thing I couldn't find was rose water. I think it would have elevated it to another level.. but alas, I had to use what I had. The recipe called for pistachios, almonds, and walnuts but instead of walnuts, I used pecans. I roasted them and ground them in a food processor. Oh man, the smell was AMAZING!! Combined with the cinnamon and all spice... the kitchen smelled heavenly. I used my homemade dough..
.. and I used store bought phyllo dough. Don't judge me!!! I needed some insurance that something was going to turn out edible! It was an EXTREMELY long process. Even after baking there's a syrup that must be made and soaked into the baklava. The homemade phyllo dough came out a bit thick and a little too crunchy but all in all it was a good attempt. But next time, I'll have to try the rose water... and just buy the phyllo dough. This is one of those recipes where homemade doesn't necessarily equate to a better dish. OMG, 100% homemade baklava! A heavenly treat! 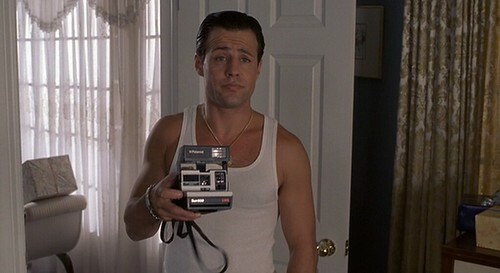 LOL- I love My Big Fat Greek Wedding!!! Great looking Baklava! I just voted for you! Best Baklava that I've ever eaten!! 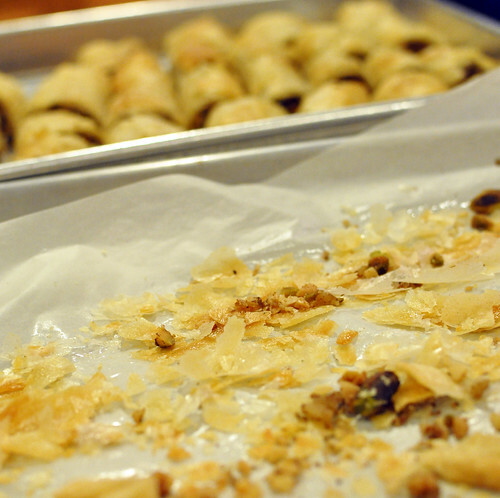 You did HOMEMADE phyllo dough??! NOW I'm impressed. I am so sorry to hear your homemade phyllo didn't live up to all the extra effort. 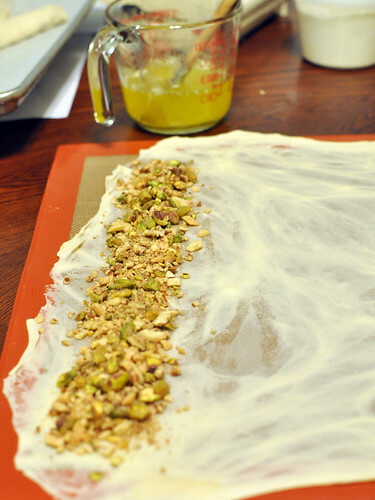 If you make homemade strudel dough, phyllo dough just doesn't compare. I figured baklava would be the same, though. sugar dates! sugar dates and figs! sugar dates and pistachioooos! Beautiful presentation and photographs. Thank you for giving me the inspiration to attempt baklava. Though I'll go with packaged filo dough! Gah! 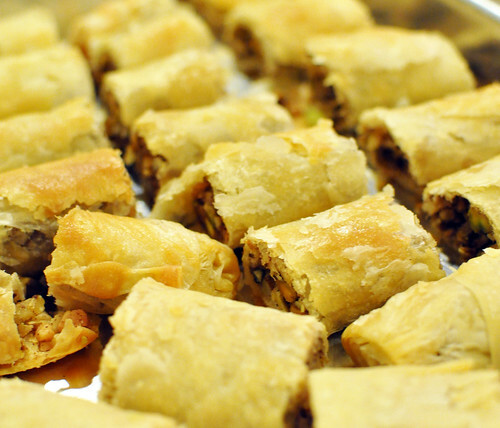 Baklava is like kryptonite to me. Even reading about it in this post has made me weak in the knees. haha! well done. Voted! Homemade phyllo? You've got to be kidding! I'm very, very impressed with this. 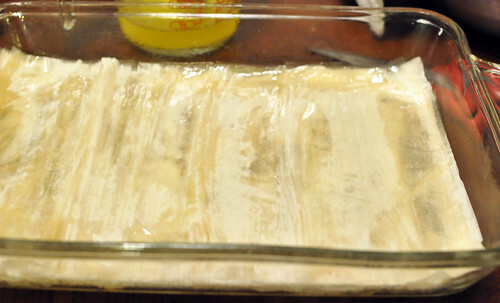 I consider this to be enough work with premade phyllo. Voting for this one, can't wait to see what's next!